Analysis Quite unexpectedly I found myself in possession of some very hot, illegal property last week. Not a looted plasma TV but rather the Samsung Galaxy Tab 10.1, which thanks to legal injunctions is disappearing from channels all over Europe. Vodafone is the latest to cancel its orders. It is a beautifully designed piece of hardware, but I fear it would soon be disappearing even without a shove from Apple's lawyers. It faces a dilemma shared by many other competitors, one I pondered on recently: it is extremely hard to sell a rival tablet right now. There are more excuses than solutions. Nvidia's CEO Jen-Hsun Huang recently offered up one or two. "It's a point-of-sales problem. It's an expertise-at-retail problem. It's a marketing problem to consumers," he explained, before adding, for good measure: "It is a price-point problem. And it's a software richness of content problem." I took the Tab through its paces to see if Samsung had drawn any closer to resolving this apathy. This isn't a review – we've already run a very entertaining one here – but more of a whodunnit. Midway between a computer and a dumb screen, the iPad makes a difficult target for rivals to aim at. I cannot emphasise enough the fact that iPad appears to have no killer app or singularly compelling use case – but it is phenomenally popular in spite of that. Aiming at the iPad is even harder now Apple is achieving some success at defending its design work, thanks to 38 lawsuits from Cupertino. If you want the 20-second summary of the new Tab, here it is. Samsung has evidently thought long and hard about the problem, and in its second generation product, made a really fine piece of hardware. But for its software Samsung almost entirely relies on Google, and the Tab shows Google doesn't know what to aim at either. Rather like a foreign stenographer who's not familiar with the language they're transcribing, Google has come up a rather literal translation. It leaves the Samsung tablet midway between a computer and a dumb screen, too. I'll start with the hardware. 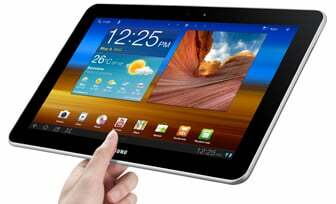 Samsung aims for the Sony crown these days, and this is evident in the design of the Tab. The Tab is purposely a landscape-oriented device, which makes sense for watching movies but not many other use cases. People who want to use the device for reading e-books, for reading web pages, for perusing Twitter and Facebook streams, and for handling email in volume, want to maximise the vertical viewing area. Most of these "views" are list views. Portrait is still the best option here. So being primarily landscape is a differentiator, yes, but one that leaves the user turning the device through 90 degrees far more often than they should need to, and (as I found) leaves the main controls far away from where the hands usually rest. It is very light, making the original iPad feel like a monster, is nicely tapered and strongly and discretely put together. As you'd expect from a Samsung, the screen is terrific. It's a beautiful machine to hold and use. Although the Tab has a slot for removable storage, it has been criticised for lacking HDMI and USB ports, and for aping the iPhone and iPod's one-connector-only design. These criticisms are merited, I think. You have to try harder when you're not the market leader, and while Apple makes a minority of users who want HD output or photo-import ability jump through hoops (aka, spending another £25 per dongle), this kind of value should be bundled. Next page: What are we building here? Is it a computer or just a fancy picture frame?